“bad.” Tiger shows how these courts fuse punitive and therapeutic approaches to drug use in the name of a “progressive” and “enlightened” approach to addiction. 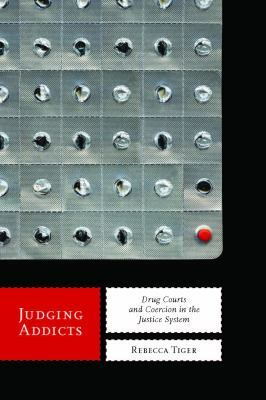 She critiques the medicalization of drug users, showing how the disease designation can complement, rather than contradict, punitive approaches, demonstrating that these courts are neither unprecedented nor unique, and that they contain great potential to expand punitive control over drug users. Tiger argues that the medicalization of addiction has done little to stem the punishment of drug users because of a key conceptual overlap in the medical and punitive approaches—that habitual drug use is a problem that needs to be fixed through sobriety.Judging Addictspresses policymakers to implement humane responses to persistent substance use that remove its control entirely from the criminal justice system and ultimately explores the nature of crime and punishment in the U.S. today. Rebecca Tiger is Assistant Professor of Sociology at Middlebury College and co-editor of Bioethical Issues, Sociological Perspectives .